Everyday chocolate cake. 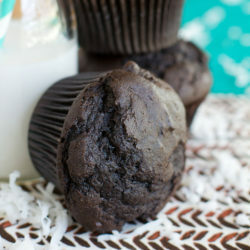 Moist, rich, and topped with a silk smooth cocoa frosting. This is one cake you’ll want to make over and over again! On Instagram a few weeks ago I set up polls to see what types of recipes you guys were interested in. It looks like you wanted to see more quick and easy desserts with some intricate show-stoppers sprinkled in between. I’m right there with you! I love a good three layer cake (hello pistachio cake), but I’m ALL about desserts you can make on a whim. Nothing too fussy, no hard to find ingredients, and nothing overly time consuming. I have three little children after all!! 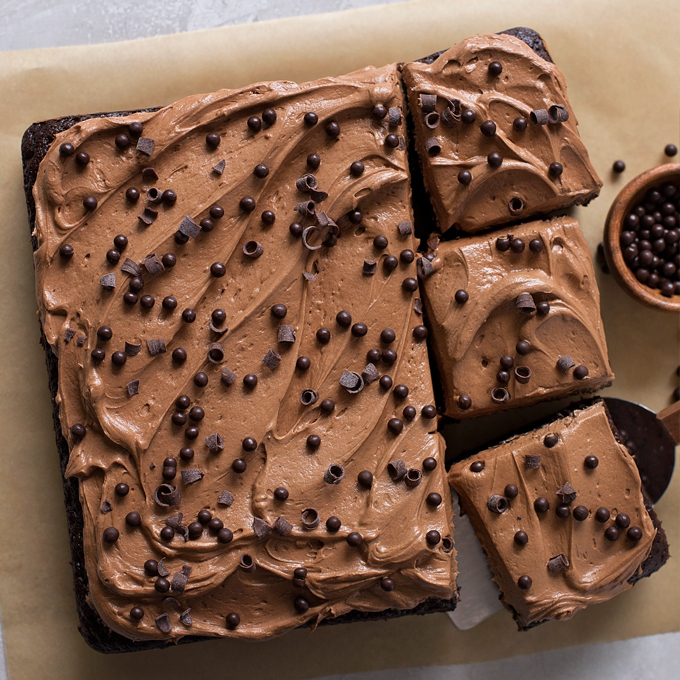 This everyday chocolate cake is one we’ve really grown to love. You make it in one bowl, in under an hour and it tastes amazing! First things first. Combine the brown sugar and granulated sugar in a large mixing bowl. I find using a bit of brown sugar adds depth of flavor and moisture to this cake. Both of which are important characteristics of a good chocolate cake! 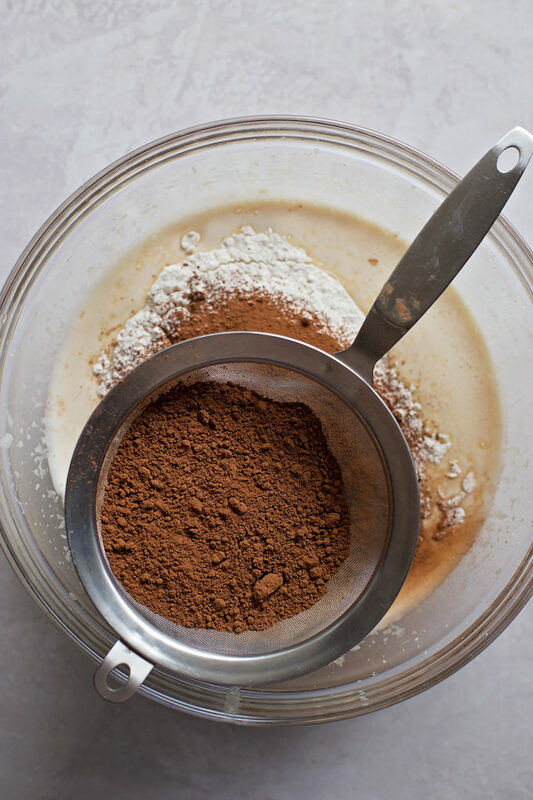 After the wet ingredients have been mixed together, add the dry ingredients: flour, baking powder, baking soda, salt, and cocoa powder. 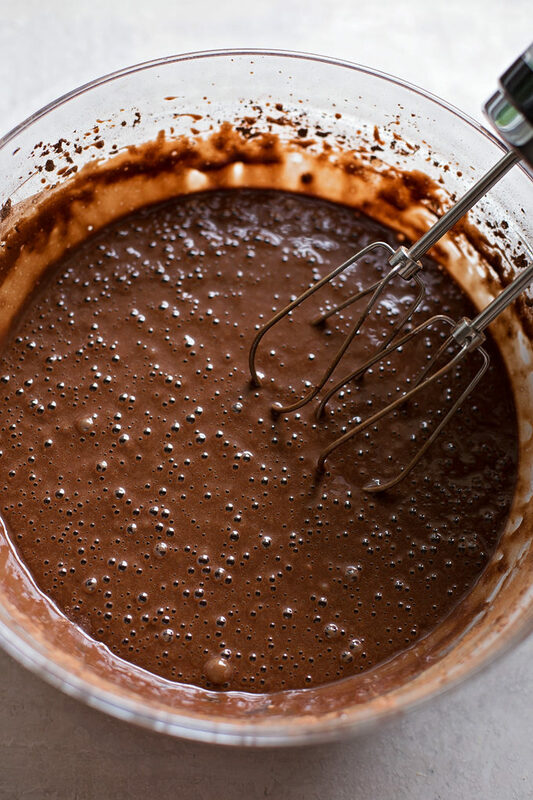 Make sure to sift the cocoa powder so that you don’t end up with clumps in your batter. 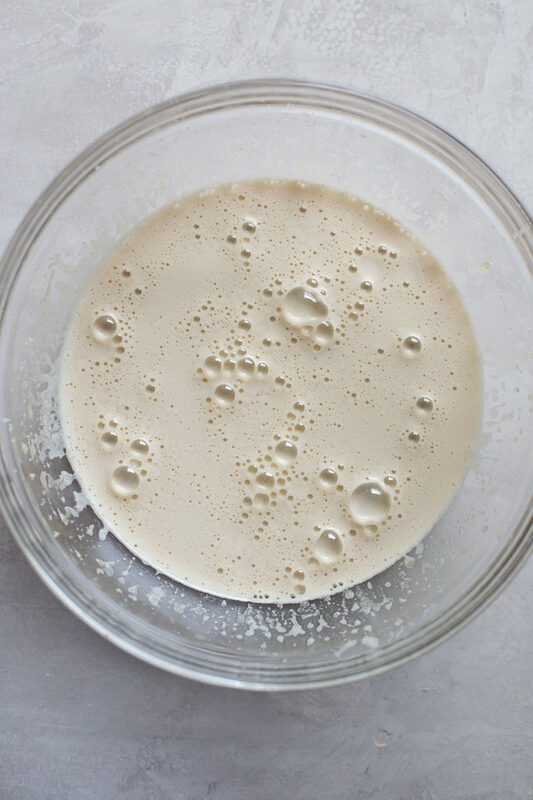 The batter should be fairly wet and runny. Bake the cake for 30-35 minutes. You’ll know the cake is done when the top springs back when touched. A toothpick or cake tester inserted into the center of the cake will also give you an idea doneness. We’re looking for just a few moist crumbs. While the cake is cooling you can whip up the frosting in the same bowl you made the batter in. The fewer the dishes the better, right?! Once the cake is completely cool, spread the frosting over top and sprinkle with chocolate pearls, chocolate curls/shavings, or chocolate jimmies. Whatever you have on hand! We’ve made this cake a few times, once with rainbow sprinkles and once with mini M&Ms. It’s definitely a clean-out-the-baking-shelf kind of cake. Serve with a tall glass of milk, cause you’re gonna need it! I hope you’ll fall in love with this everyday chocolate cake. It’s rich, moist and decadent. Everything a good chocolate cake should be! P.S. I’m hoping to add a few more “everyday cakes” to the blog. What kind of cake would you love to see simplified? Leave a comment below and let me know! 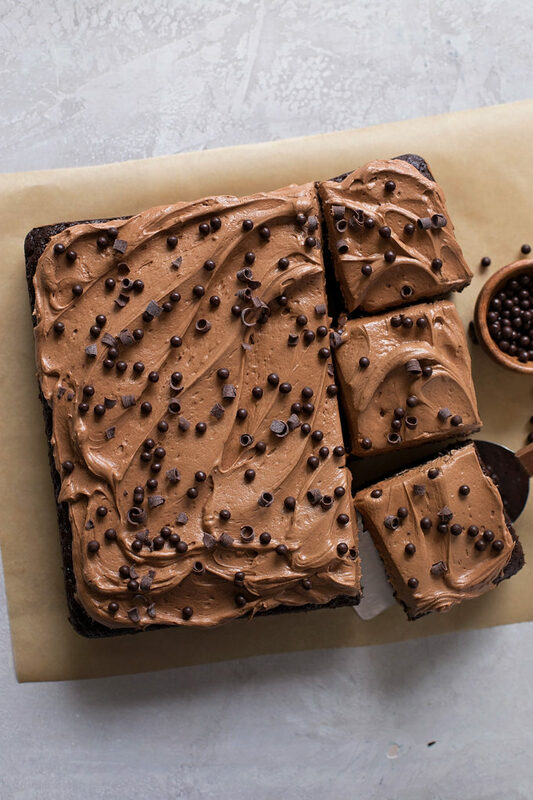 Everyday chocolate cake. 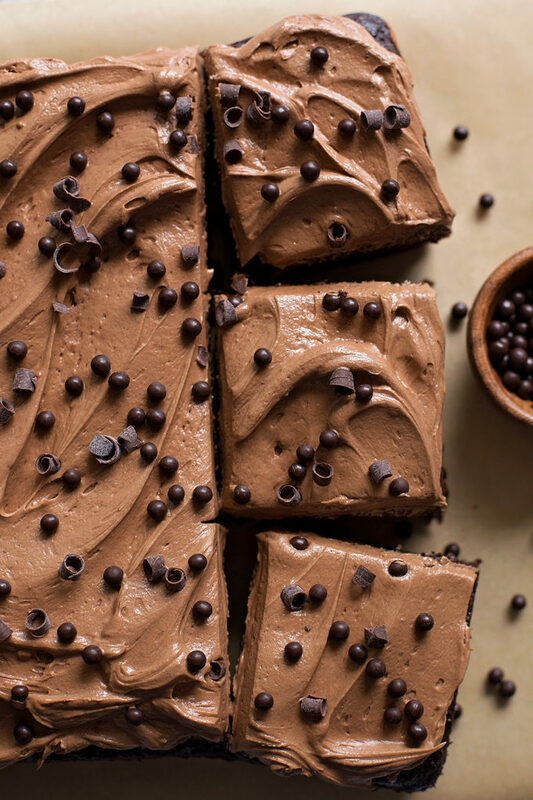 Moist, rich, and topped with a silk smooth cocoa frosting. 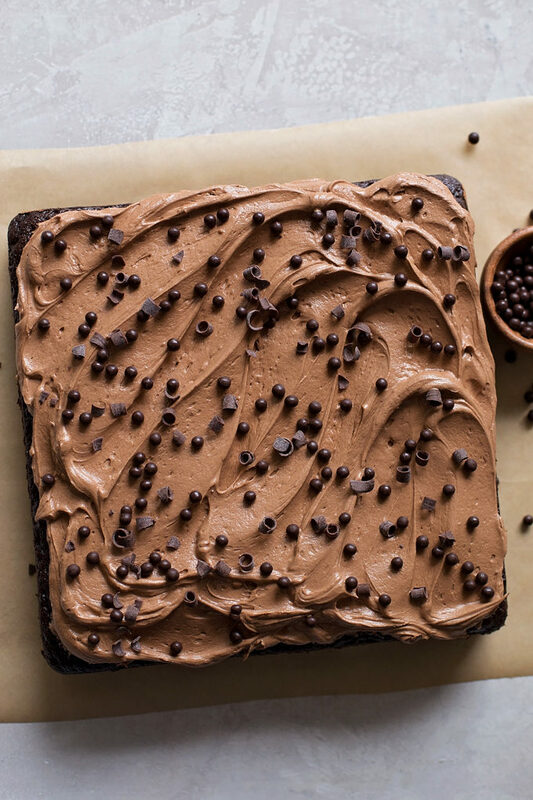 This is one cake you'll want to make over and over again! Preheat oven to 350 degrees. Line an 9x9-inch square pan with parchment paper, set aside. 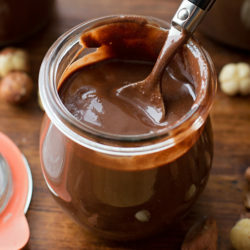 In the bowl of a stand mixer or a large bowl with a hand mixer, beat the sugars and oil for 30 seconds. Add the vanilla and eggs, mixing well after each addition. Pour in the vanilla, buttermilk and hot water. Mix until combined. Add flour, baking soda, baking powder, and salt. Sift cocoa powder over top. Mix until combined, about 30 seconds. Pour into prepared pan. Place in the oven and bake for 30-35 minutes or until the top springs back when touched (or a cake tester inserted into the center comes out clean). 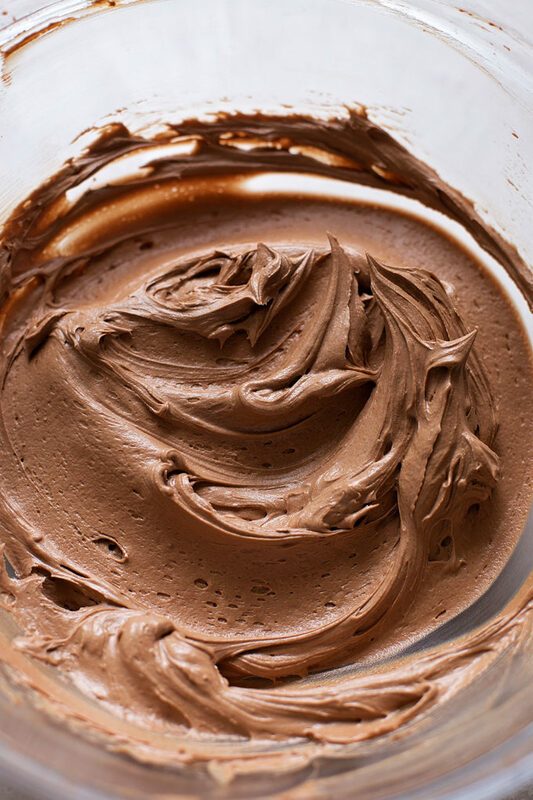 For the frosting: in the bowl of a stand mixer or a large mixing bowl with a handheld mixer, beat the butter until light and creamy, about 2 minutes. 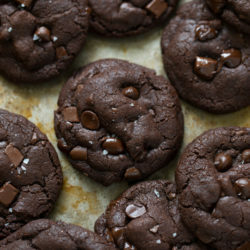 Carefully add in the powdered sugar, cocoa powder, milk, vanilla and salt, beat until fluffy, about 2 minutes. Spread over the cooled cake. Top with desired garnishes. hey girl- this is right up my alley! yummy for my tummy! How about an everyday coconut cake? Adding that to my list! Thanks for the suggestion Lynn! Can you substitute sour cream instead of buttermilk? Totally amazing! They were so moist!